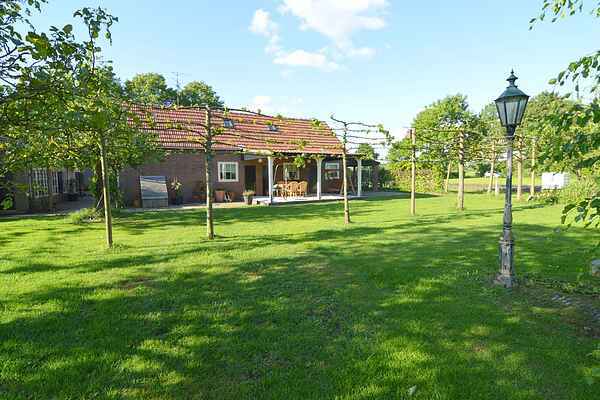 This lovely detached holiday home is located on the outskirts of Alphen in what's known as a 'Green Triangle', meaning that Alphen is surrounded by enormous forests. The area is characterised by lots of natural beauty and many cycling routes and hiking trails. You can walk right into the forest after about 500 metres. The name Green Cottage refers to the fact that the accommodation is situated on a parcel of about 6,000 m2 where organic vegetables and berries are grown and organic fruit is harvested from our own orchard. As a guest, you can enjoy the fresh organic fruit and vegetables that are in season at the time. You will also be offered organic honey from our own apiary and can enjoy a farm-fresh egg from the 'house chickens' every day. The house is furnished in a warm and comfortable design and the entire ground floor is equipped with heated floors, even the 2 bathrooms. There is free WiFi and interactive TV. The home also has a luxurious kitchen and an area where you can safely store your bicycle or motorcycle. The covered terrace, where you have an open view of the large garden, vegetable garden and orchard, is a great place to spend time. The popular Beekse Bergen and Efteling amusement parks are located nearby.